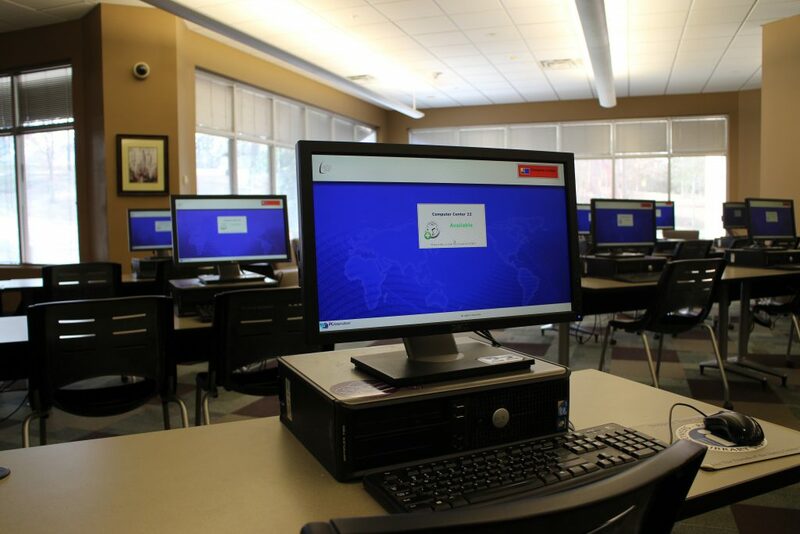 Located on the lower level of the Nancy Guinn Memorial Library, the Computer Center has 48 computers available for patrons with a valid PINES card. Four Express computers are provided for public use, and visitor passes are available for out-of-state guests. Our computers run Windows 2007 and offer the Microsoft Office 2007 Suite. Available internet browsers are Internet Explorer, Mozilla Firefox, Google Chrome, and Opera. There are also printing, faxing, and scanning services available. The charge for printing documents: $.15 per page (black and white only). The charge for faxing: First page – $2.00 | Additional pages – $1.00 each. Use of the scanner is free of charge and patrons may email or save a digital copy of their documents to a USB drive (patrons must bring their own USB drives). The Computer Center staff offers four classes every month: Computer Basics, Internet Basics, Social Media Basics, and Microsoft Word 2007. Please contact the Computer Center at #770-388-5040 ext. 102 for details and class times and dates. All classes are available for sign-up in the Computer Center at the beginning of every month and are free and open to the public.